Apple Digest: Apple News & Fundamentals: Still Strong! Apple News and Fundamentals: Still Strong! Apple iPhone 4 mania has died down some. On June 28 Apple announced that 1.7 million units had been sold. No word yet from Apple that 2 million have been sold. AAPL closed the week at $259.62 on Friday, July 9. The overall market downdraft has pulled AAPL down. Apple's stock hit an all-time closing high on Thursday and Friday, June 17 and 18, of $271.87 and and $274.07, respectively. This topped the previous all-time closing high of $270.83 on April 23. Analysts continue to raise AAPL price targets and is reviewed here. A technical review of the AAPL stock chart will be posted later this weekend. There's hype, then there's Apple iPhone 4 hype plus mania! The official launch and sale began on June 24 in Japan, Germany, France, UK, and USA. Pre-orders began Tuesday, June 15. The Apple and AT&T websites crashed during pre-ordering. The FedEx website crashed the next week as the pre-orders were shipped. 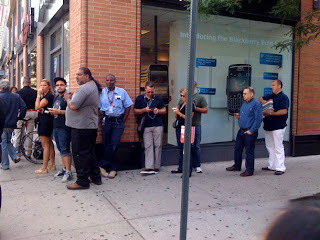 There were lines at Apple and AT&T stores for iPhone pre-orders and lines at Apple, Wal-Mart, Best Buy, and Radio Shack stores pre-order the iPhone 4. AT&T stores did not participate in the official launch due to the overwhelming demand. The delivery dates were pushed back. Only the black model is available, the white model has been delayed until mid-July. Apple announced 600,000 units were pre-ordered the first day. Apple Inc. achieved a milestone the week of May 24, 2010, passing Microsoft in market capitalization to become the largest technology company, and second overall largest company, in the USA. AAPL's market cap is now $236.24 billion, compared to Microsoft's of $212.70 billion. Exxon leads with $276.15 billion. Microsoft still leads Apple in total net profits. Apple is now 19.76% of the NASDAQ 100 index, weighted by market capitalization. AAPL was reported to be the second most traded stock in June by volume. Apple announced on June 22 that 3 million iPads had been sold in 80 days and that 11,000 apps were specifically for iPad while another 225,000+ apps for iPhone and iPod Touch could also be used with the iPad. Apple had previously announced on May 31 that 2 million iPads had been sold in less than 60 days. Therefore, the sales are increasing at an increasing rate. The iPad is now outselling Macs. The international launch was May 28 in 9 countries and the frenzy ensued. Apple launched the iPad in the USA, the Big Day, on Saturday, April 3. Reviews of the iPad have been favorable overall with 91% consumer satisfaction, and 1 in 5 USA consumers plan on buying an iPad. The iPad email breach via AT&T seems to be old news now but was reviewed here. Samsung was reported the week of June 14 to have begun volume shipments of the iPad panels, along with existing supplier LG. This revises estimates of monthly iPad sales at 1.2 million, up from the previous Apple report of 1 million per month. The "Death Grip" that blocks antenna reception created a huge buzz later on the day of the June 24 launch. Apparently this issue can be corrected by scotch tape, a case, or a bumper over the affected area. However, this did dampen launch day. CNET tested the antenna here and determined there is a reception issue if the iPhone 4 is held a certain way.. The iPhone 4 was launched on June 7 by Steve Jobs at the Apple Worldwide Developers Conference. Pre orders began June 15 and the official release was June 24. Price is $199 for 16GB and $299 for 32GB. The iPhone 4 web page is here. The Apple Hype began on the iPhone 4 new features: video calling and chat, a dazzling retina display, multitasking, HD video, and even Netflix will be available in July! Apple iAd went live this month. CEO Steve Jobs introduced the new personalized, mobile advertising system, iAd, on April 8. This will compete directly, and replace, Google's advertising platform. Apple is going into the mobile advertising business and will design and sell the mobile ads. While iPad and iPhone sales will positively impact Q2 earnings, the iAd platform may well have a significant impact in future quarters as this revenue stream comes online. Currently, the iPhone developers agreement excludes Google access, but the Wall Street Journal reported July 2 that Apple was allowing Google to sell targeted ads. Analysts' estimates are reviewed here. Q1 earnings were released on April 20 and AAPL beat on revenues, EPS, and outlook. Numerous analysts raised price targets to $300+ within 48 hours. The updated iPad sales data on June 22 and the iPhone 4 launch on June 24 generated another round of analysts' raising AAPL price targets. Every week one or more analysts raise the AAPL price target, all in the $300+ range and now approaching or exceeding $350. The highest price target is $390 by JP Morgan. Q2 will include all iPad sales year to date, apparently some iPhone 4 sales, and should be another stellar quarter. In Q3 the iPhone 4 sales will have full impact. More than 50% of Apples sales are outside the USA. In June, Apple has now sold 100 million devices since inception. The iOS developers agreement applies especially to the new iOS 4 and most importantly to the iPhone 4 and iPad. Apple restricted this agreement, which promptly excluded Adobe Flash and Google. Later Apple loosened the agreement some by providing for Apple's written permission for exceptions. Google was selling targeted ads on iPhone and iPad as of July 2. Probably Apple is backing off some restrictions as the FTC reviews Apple for restrictive trade practices. This could end up a very interesting story if Apple continues to block Adobe and Google while meanwhile being investigated by the FTC. The iPhone OS was #1 and had 58.8% of the mobile web consumption in North America for May 2010 per Quantcast. AdMob reported iOS has a 48.8% worldwide market share (iPhone + iPad + iTouch) in May 2010. The iPhone OS had 24.4% of all USA subscribers in May 2010 per comCast. Apple is not just a brand, it is apparently a lifestyle and a consumer statement. A couple got married in the New York City Apple store earlier in 2010. A camper showed up a week before the June 24 launch and sale of the iPhone 4 at the Dallas Apple Store. Last, but no least, it was reported on June 18 that an iPad app was being developed for church Daily Missals. Apple was the #9 USA web brand, based on unique audience/visitors, in May 2010 per Nielsen. Apple opened its second store in China, at Shanghai, on July 10. Follow AppleDigest (Apple Reporter) On Twitter!